Westminster offers many opportunities to reach out to our brothers and sisters, locally and around the world. There are volunteer options for individuals, groups and families. We hope you will take a moment to consider what opportunities reach out to your heart so that you might reach out to others in Christian love and service. For more information please contact one of our Mission Chairs or call the church office 713-782-7750. Matt Monzingo, Cloy's son, grew up in Westminster UMC and is now a missionary to Kazakhstan. We support Matt and his family with our prayers and gifts. Matt is with East/West Ministries International. For more information please go to www.eastwest.org. We are always looking for selfless volunteers to help on any given Sunday or during events throughout the year. If you want to get connected to reach out more within the walls of Westminster, please let us know. 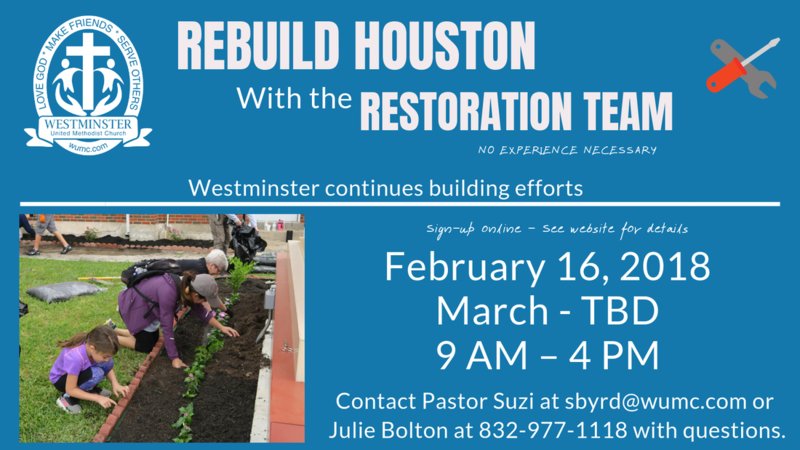 ​Westminster teamed up with Restoration Team to help Rebuild Houston. We have helped numerous people in and around Houston. Thank you to all of our faithful and hard working volunteers for all of their time. We are so blessed to have this community. Click image to sign up for any or all dates. Christian Community Service Center provides caring and a valuable service to Houston's people on low and fixed income. Westminster supports CCSC through gifts and volunteers. ​Please help by donating money or volunteering by going to their website at Christian Community Service Center. ​​Westminster at work in the community. Serving lunch to 60 teachers and staff at Tanglewood Middle School. It's a blessing to be a blessing. If you'd like to join us in serving this community, contact Rev. Suzi Byrd to find out more details.